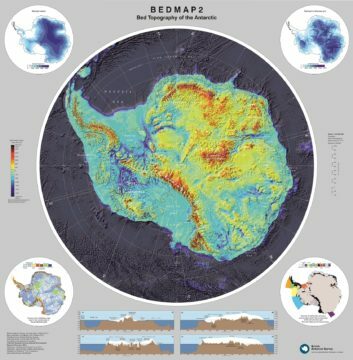 Description: Limits 90° S – 60° S.
This geophysical and glaciological map shows the surface of the bed beneath the Antarctic Ice Sheet. The surface elevation was created using data from a variety of sources, including many substantial surveys completed since the original Bedmap compilation (Bedmap1) in 2001. In particular, the Bedmap2 ice thickness grid is made from 25 million measurements, over two orders of magnitude more than were used in Bedmap1. 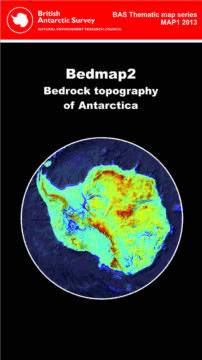 In most parts of Antarctica the subglacial landscape is visible in much greater detail than was previously available and the improved data coverage has in many areas revealed the full scale of mountain ranges, valleys, basins and troughs, only fragments of which were previously indicated in local surveys. The map shows the elevation data with key place names and the coastline and grounding line indicated. 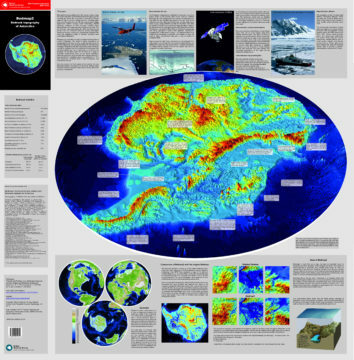 The map also includes cross-sectional profiles through East and West Antarctica and separate panels showing the geographical distribution of primary survey data and reliability of the bed surface. On the reverse side is an oblique view of the continent with information and statistics given regarding key areas of interest.